Brenda Mack, right, recognizes the winners of the annual George Mack Scholarships, named for her late husband. At left is Ashley Bonetz, a Daniel Boone High School senior, and, at center, Tanner Quigley, a Hamburg Area High School senior. It was a championship evening at the third annual Crime Alert Berks County Race Against Crime held Thursday night, May 18, at Slick Willy’s at the Works in Wyomissing. More than 150 spectators cheered on members of the law enforcement and firefighting community as well as local business leaders who competed for the best time in a number of go-cart heats at the indoor racing facility. Mike McDermott of Mortgage America captured the adult championship and won $1,000 to donate to the charity of his choice. McDermott chose CrimeAlertBerksCounty. Winner of the junior competition, which was limited to competitors in the fourth and fifth grades, was Riley Civiello, a fifth grader at ConradWeiserElementary School. Both McDermott and Civiello received trophies. The fifth grader will also receive an ice cream party for his classroom. Gabriel Brunner, age 11, a fifth grader at the Gov. Mifflin Intermediate School, won first place, while his classmate Sophia Garman, 11, placed second. Securing the third-place slot was Emily Horowitz, 11, a fifth grader at TildenElementary School. All received framed certificates with their artwork. Brunner also received a PS4Pro home gaming system. 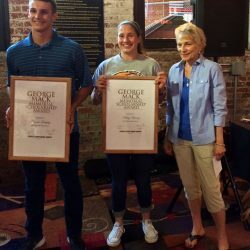 Finally, the winners of the annual George Mack Scholarship were announced. The late Mack was a long-time member of the Crime Alert Berks board. His widow, Brenda Mack, presented the scholarships, valued at $1,000 each. The recipients are Berks high school seniors who plan to study criminal justice in a higher educational institution. Ashley Bonetz, a DanielBooneHigh School senior planning to attend KentStateUniversity in Ohio, and Tanner Quigley, a HamburgAreaHigh School senior set to attend the Berks Technical Institute in Wyomissing, accepted their awards from Mrs. Mack. The Race Against Crime falls in the middle of National Police Week. Throughout the month of May, Crime Alert Berks County is honoring law enforcement officers with its second annual Ribbons of Respect campaign. Some 25,000 blue ribbons have been distributed and are being displayed throughout the county to honor law enforcement professionals. Ribbons are still available by contacting any member of Crime Alert Berks via the Web site www.alertberks.org or via the Crime Alert Facebook page.